Happy Thanksgiving everyone! On this most auspicious eating holiday, I look forward to nothing more then the desserts. 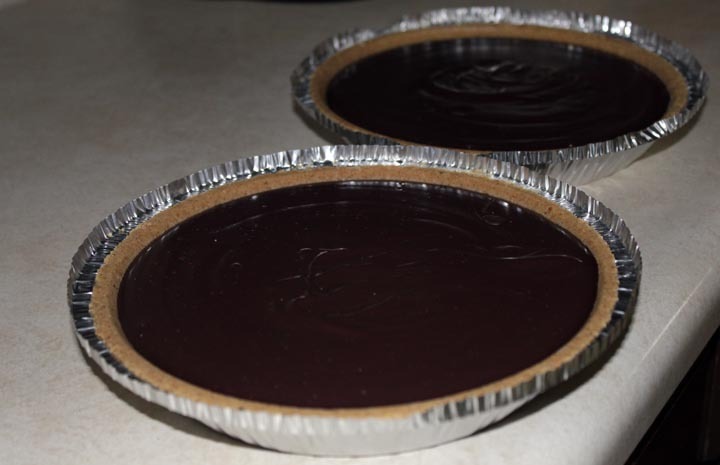 My contribution to Thanksgiving Dinner this year is my infamous, Ultimate Chocolate Pie of Dooooooooommmmmm……. I’ve you’ve never had one of my ultimate snacks of doom I am sad for you. If there’s one thing I know well, it’s snacks. For a snack to receive the ultimate snack of doom title means it’s something pretty special, has spent years in development, and has enough calories to supply a small village with sustenance for a week. Ultimate chocolate pie of doom is my own secret recipe, developed over years by making and consuming many hundreds of chocolate pies. Yes hundreds! Have you seen me? If you have, you’d believe it. 😉 People think cooking is all about the recipes, but the reality it’s all about the ingredients. Especially the secret ingredient. The pies will get topped with fresh whipped cream and some shaved chocolate just before being served after dinner. Thanksgiving is about giving thanks. This year I’m most thankful for having some pretty amazing friends who help me out when I’m desparate, put up with my BSR, and support me in my crazy ideas/projects. I’m also thankful for my family, my health, my super cute niece and nephew, and of course I’m thankful for Ultimate Chocolate Pie of Doom for desert today. Have a gobble gobble great Turkey day everyone!